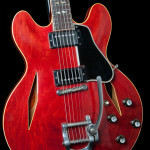 Tremolo Arms – Love them or hate ’em, tremolo arms (or vibrato arms) are here to stay and are a feature of many different vintage guitars. For most players the two units that stand out above all the others are Paul Bigsby’s highly distinctive ‘vibrato tailpiece’ and Leo Fender’s famous ‘tremolo’ unit as seen on the Fender Stratocaster. The original design concept with these units was to add a subtle vibrato to chords or single notes in the manner of a pedal steel guitar. Paul Bigsby’s design is still in production today and is a factory fitted feature on many brand name instruments including Epiphone, Fender, Gibson, Gretsch, Guild, Hamer, and Ibanez. 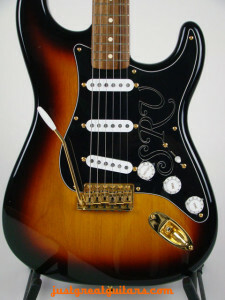 Leo Fender’s ground breaking design of a ‘tremolo unit’ is also still in production most notably on the Stratocaster. The first guitarists to embrace the notion of playing with a ‘tremolo’ arm (the term is actually misleading as the unit adds vibrato and not tremolo) were likely very influenced by Country guitar players and pedal steel players, so their playing reflected this. 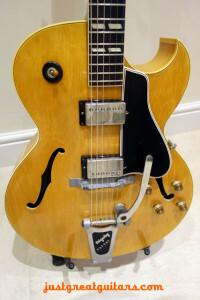 As time wore on and the 60’s musical scene changed, the use of these vibrato units also changed and beginning with Rockabilly artists and later instrumental groups like The Ventures and The Shadows, the use of the arms became more prevalent. By the end of the 60’s with artists like Jimi Hendrix and others, the tremolo arm of the Fender Stratocaster in particular was reaching new forms of musical expression and application. Hendrix can be heard really taking it to extremes in his performance of the ‘Star Spangled Banner’ at Woodstock in 1969. Rock guitarists such as Eddie Van Halen resurrected the use of the tremolo arm in the late 1970’s and early 1980’s to the point that most electric guitars of the ‘Stratocaster’ family now come either with (or with the option of) a tremolo arm. Guitarists such as Jeff Beck have taken the use of the tremolo arm to previously unimagined heights, whereby it can be employed to emulate slide guitar, copy microtonal melodies and add vibrato that would be impossible with fingers alone. Check out some of the links on the photos here for current JGG guitars with one of these units fitted. Whether 60’s ‘twang’ is your thing or modern-day ‘dive-bombing’ ala Mr Van Halen, you’ll find a guitar to fit.